Here at Naval Bagels, we love all four seasons (five, if ya count Football!). We especially love all the fun fall activities in Annapolis and the surrounding area. And, while the weather may not say “Autumn” the calendar certainly does! So, that means pumpkins, football, hayrides and more! Check out all the fun the area has to offer. Get out your corsets and quilts (or not) and head to one of Maryland’s most beloved fall activities. The Maryland Rennaissance Festival is the second largest in the country. For the past 40 years, the festival has delighted locals and travelers at the Revel Grove as they take a step back in time to visit the 16th Century. Stroll through the English village complete with characters including King Henry the VIII and his court. Check out 10 stages boasting over 200 performers and entertainers. Eat and drink and be merry as you enjoy over 48 food and beverage emporiums. Snag one of the 3000 seats and watch the live jousting tournament. So much to see, so much to do, one weekend may not be enough! We are not shy about our love of everything Navy. And one of our favorite seasons is Football Season because that means Navy football and tailgating! If you have never been, make this the year you check it out. Surely you have a friend you can “impose upon,” heck, if you offer to bring food (Like Naval Bagels) you may even get a repeat invitation all season long! Check out one of Annapolis’s most exciting fun fall activities right in the heart of the Historic Capital. Every year the festival gets a little better! Experience 6 weekends filled with themed activities and events. Explore the 5-acre corn maze, enjoy a friendly game of pumpkin bowling, check out the thrilling giant jumping pillow or the underground slide, plus so much more! Fun to be had for everyone! Homestead Gardens’ Annual Fall Festival is the largest in the Annapolis area. Bring the entire family and enjoy this annual tradition. Check out the rides and attractions, demonstrations, entertainment, food, and beverages. Don’t forget to pick up a couple dozens of Homestead’s world-famous apple cider doughnuts. Walk around inside the center for pumpkins, flowers and everything you need to decorate for Fall! The nation’s oldest and largest in-water sailboat show is in its 47th year! Survey the exclusively new boats on display. Join the more than 50,000 other enthusiasts visiting the expo in America’s Sailing Capital. This event is known as the premier showcase for all things sailing such as boats, attire, accessories, and foul weather gear. Now in its 45th year, this is the nation’s oldest and largest in-water powerboat exhibition! Browse among everything from luxurious motor yachts and trawlers to high-performance boats and offshore fishing machines. Check out the popular family cruisers, center consoles, inflatables, plus the world’s largest power catamaran section. A great place to find the latest selection of marine equipment, high-tech electronics, accessories, gear, and related services. Get in the Halloween spirit with a spooky Ghost Tour through Maryland’s Historic Capital. Stroll around downtown Annapolis as the sun sets and following your guide as he shares stories of drowned watermen and other spirits that linger in the spiritual realm. A period dressed guide will lead you by candlelight through the haunted streets of Annapolis. Choose to check out the historic haunts or the eerie pubs. 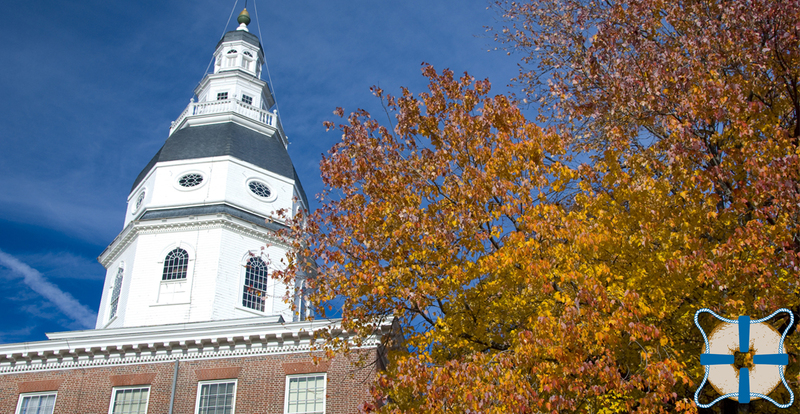 Autumn is a glorious time of year in Maryland’s Historic State Capital. We invite you to check out some of the awesome fun fall activities in Annapolis and the surrounding areas. Make sure to stop by Naval Bagels and pick up a bag of bagels and some spreads for sharing, or fuel up with one of our tasty breakfast or lunch sandwiches. Enjoy!